I missed this Quinnipiac poll last week [Sept. 24, 2015], when the fetching Mrs B and I were on our Las Vegas vacation, from the Washington Examiner. To me there is one result that shows clearly why Donald Trump cannot be the GOP nominee, if we [GOP] actually want to win back the White House in 2016. No, it's not the fact that Hillary loses to both Jeb Bush and Dr. Ben Carson and is tied with Carly Fiorina [3 of the 4 people that the poll asked questions about], while at the same time leads Donald Trump 45-43, which is troubling in itself. It is the fact that Bernie Sanders beats Donald Trump in a hypothetical matchup, 49-42. For the benefit of Pittsburgh Steeler fans, let me repeat that. Socialist, I repeat avowed Socialist, Bernie Sanders beats Donald Trump 49% - 42%. This poll not only shows Hillary Clinton beating Donald Trump and the socialist Bernie Sanders beating Donald Trump, but VP Joe Biden smashes Trump 51-42%, well outside the margin of error. Your honor, the GOP voters, I rest my case! Hold it, an even more recent poll has just come out of a hypothetical match up between Socialist Bernie Sanders and [who knows what he is] Donald Trump from an NBC News/Wall Street survey done by Hart Research Associates polling firm. Questions asked 9-21 thru 9-24, 2015 of 620 Registered Voters. If the election for president were held today, and Donald Trump were the Republican candidate and Bernie Sanders were the Democratic candidate, for whom would you vote? People much smarter than me have said Trump's tax plan "sounds" good but does little to actually get the economy MOVING again. I still shake my head at where we are as a nation right now. 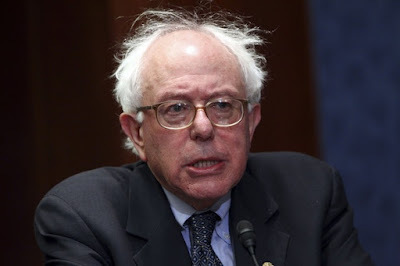 A Socialist running for president, a president who does nothing and literally wishes to "lead from behind." A terrible vacuum created in the ME by Obama is being filled by Vladimir Putin, because he KNOWS that Obama is WEAK. Only one bright light: Netanyahu is in the UN telling the UN and, essentially, America to go to hell. Israel will defend Israel. Here is ONE man who knows how to defend a nation. yep, BZ, I just heard from Bibi Netanyahu one of the most powerful riveting speeches I have ever heard...now this is a leader!